There are now a lot of opportunities available to earn money with your smartphone device. One such opportunity to earn money is to view ads before unlocking your device. ScreenPay is an app that provides this kind of opportunity. It will pay you money to install the app and let it run ads every time you unlock your device. As for earnings, the app will only allow you to earn $3 a month for viewing the ads every time you unlock your mobile device. But is this really a legit opportunity or just another scam? ScreenPay is a lock screen app that will pay you money for installing it on your device and allowing ads to run every time you unlock your smartphone. You will be paid in cash monthly, which you can withdraw via PayPal, once it reaches the minimum requirement. I labeled the app as borderline legit because I have some concerns about it. The main concern I have with the Screen Pay app is that it has already been removed from the Google Play Store, which somehow means the app has not been doing well. There are also a lot of complaints about the app not paying its members, which could also result in why it is not available in the Google Play Store. The ScreenPay app is still available for download, but by other means and the website is still up. This could mean the app is not yet dead, but it may be close. As for the earnings, you will see as the review continues why $3 a month is what you can likely expect with the app. Who Uses the ScreenPay App? The ScreenPay app is made for two types of people, with one being the advertisers who are looking to reach people while they are on their mobile devices. The other type are people like you who are looking to make some money using their mobile device. For advertisers, ScreenPay gives them an opportunity to reach people every time they use their device. Since the app is a lock screen app, the ads will be played every time people unlock their smartphone. The app also asks members to provide more information about their profiles and interests. In this way, advertisers are assured that the ads they are putting on ScreenPay will be viewed by the right person and not just by any random people. For people like you, the app gives an opportunity to make some money by just unlocking your mobile device. There’s no need for you to answer anything or do some sort of task. You just need to keep the app installed and the ads running and you will be paid in cash every month. Your money can be withdrawn via PayPal once it reaches the minimum requirement. Becoming a member of ScreenPay is also easy to do, as you will just need to download the app and register, which is free to do so. How Do You Earn Money with the ScreenPay App? 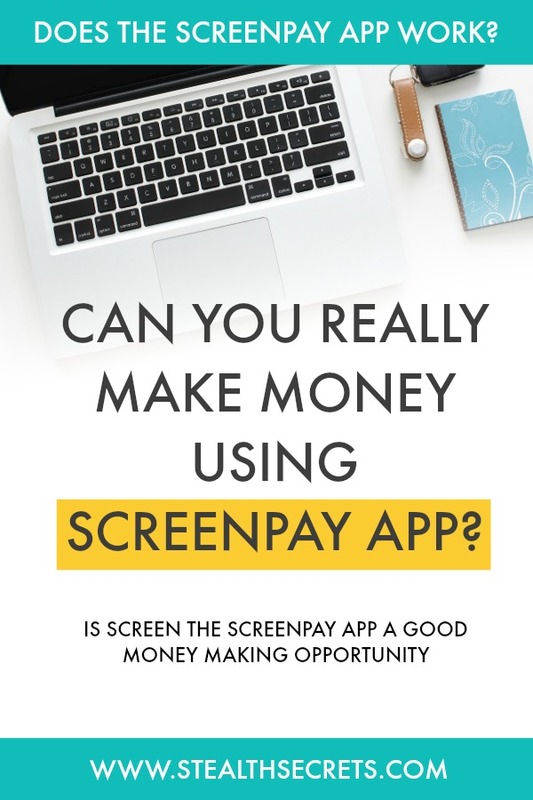 As mentioned above, you earn money with the ScreenPay app by installing it on your smartphone device and letting it run ads every time you unlock it. The app will pay you in cash, which you can withdraw via PayPal once it reaches the minimum amount required to withdraw. The first thing you would need to do is to download and install the app on your mobile device and sign up, which is free to do so. The app will only require your full name, email address, chosen password, zip code, gender, and age. Once done you can access the main interface of the app. The first thing you need to do is to choose the topics that you are interested in. You will be allowed to select 4 categories and these categories will be the basis of the kind of ads or promotions that will be shown. Once you have selected the categories, the next step is to link your PayPal email to the app. Once you’re done, you will receive $1 for signing up and completing your profile. ScreenPay will basically show ads and promotions every time you unlock your device. The app won’t pay daily but every 30 days. For keeping the app installed and running for 30 days, you will earn $3. The app will basically pay $3 every month for keeping it installed and running the ads. The app doesn’t have any other way for you to earn more except for its referral program. You won’t get paid for every person you refer, but you will get paid after you have referred 5 friends. The app will pay you $3 for every 5 people you refer to join. It is a requirement, though, that they keep the app for at least 30 days before you get your money. If even one of your referral uninstalls their app before 30 days, you get nothing. Fortunately, ScreenPay has a low cash out requirement, as you will be able to withdraw your money after reaching $7. This means, that you can cash out your money after 2 months of using the app unless you will be good at referring people to join. Now that we have learned more about the ScreenPay app, it is time to discuss what is good about the opportunity it gives. The first thing that I liked about the ScreenPay app is that it pays you in cash. It doesn’t pay you in points or credits that you can redeem for gift cards or other prizes, it pays you outright in cash that you can withdraw via PayPal after reaching the minimum cash out requirement. It’s also a good thing that the ScreenPay app allows you to make money without the need to actually do anything special. Just by installing the app and letting it run ads every time you unlock your smartphone device will earn you money. No need to answer surveys, download apps, or click anything. Just unlock your device and you will earn. I also like that the ScreenPay app also has a low cash out requirement. You only need to reach $7 to be able to withdraw your money, which could be easy to do if you are good at referring people. Once you have $7, you can withdraw it via your PayPal account. Of course, there are also several things that I consider bad about the ScreenPay app, which I’ll discus here. My first issue with the app is the fact that it is no longer available for download on the Google Play Store, which could mean that it is close to shutting down. This could also mean that the app isn’t really able to sustain its business model, thus it is likely already in the process of closing its operations. I also didn’t like that the ScreenPay app doesn’t have any other methods of earning money except referring people. This is bad because you will likely have to wait 3 months before you are able to withdraw your money since the minimum requirement is $7 and the app only pays $3 a month. This means that you will only be able to withdraw your money after using it for at least 3 months. The referral system of the app is also bad, as you will need to be able to refer at least 5 people and they have to have the app installed for at least 30 days before you are paid $3. Every one of these 5 people would need to keep the app installed for 30 days or else you won’t earn anything. Is the ScreenPay App to be Recommended? After learning more about the ScreenPay app and what it does, I would say that it is something that I wouldn’t recommend to anyone. The fact that it is no longer available on the Google Play Store should raise some red flags to anyone who is thinking of downloading the app. It also looks like the app is not functioning properly anymore, as there are issues if you try to complete your profile or select the categories that you like. Even if it doesn’t have that issue, though, I still think the app could be a waste of time, considering there’s really no way for you to increase your earnings here other than referring people. But that is even a bit problematic because you will need to have at least 5 people signing up for the app. If you’re only able to refer 4 people, you don’t get to earn anything. So if you’re looking for ways to make money with your smartphone device, the ScreenPay app is not your best option. There are more worthwhile opportunities out there. S’more App Review: A Legit Way To Earn Using Your Smartphone Or A Scam?